“No, just downloading pictures,” I would reply. Then they would stop and watch for several minutes as the pictures slid across the screen. It was a great way to communicate and we swapped stories and got identification of animals and advice. 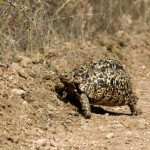 Found out, for instance, that my picture of the Leopard Tortoise was unusual because they hibernate during the winter. 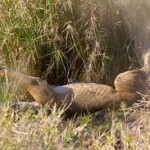 That explained why we hadn’t seen any snakes. 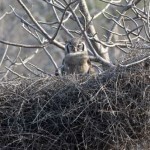 Several people discussed at great length the owl sitting in a huge nest. Owls aren’t usually exposed like that during the day. 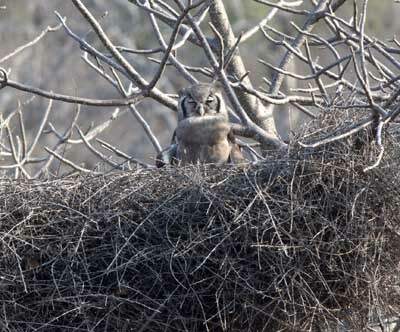 That couldn’t be his own nest – he was just borrowing it for a nap. And out would come the bird book for further information. Word was out that we were seeing a lot more than most people do on their first trip into the Park. We saw some of the same people at different camps and it was good to see familiar faces. 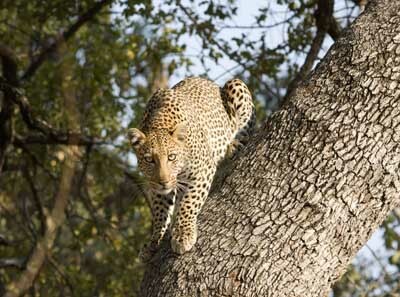 South Africans love their Park – many of them come and stay 3 or 4 weeks, 2 or 3 times a year. So much to be thankful for! Leaving the Tsendze area we continued our trek north to the rest camp Shingwedzi. The word was that Shingwedzi had a “resident” lion that prowled the fence at night filling the darkness with terrifying roars! Finally, a lion! I heard his call several times during the night and it was like a lullaby to me. 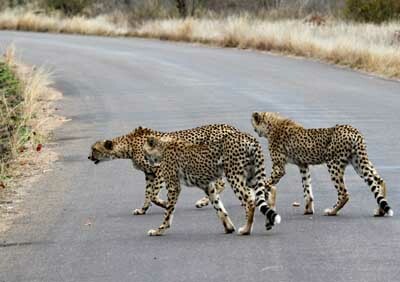 We rushed to the gate in the morning, but several cars were ahead of us and that was good – the more eyes, the better. 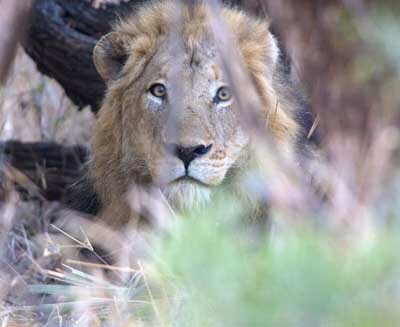 Someone spotted the lion resting under a nearby bush right by the road. Then came the usual jockeying for a good picture-taking position, and finally when it was our turn, I got this one shot. 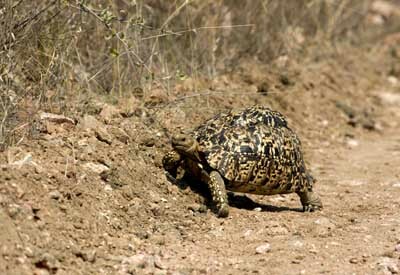 He then got up and slowly strolled away through the brush. Thank you, Lord! 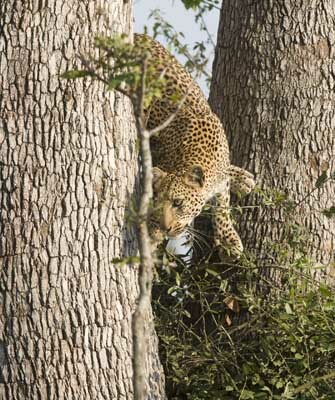 “It’s a Leopard” she hissed excitedly. What magic words. I immediately tumbled into the back seat and sprawled across the luggage. Fortunately, I had the 70-200 lens on the camera, she had the window down by the time I got there and I was able to start snapping immediately without having to made any adjustments. 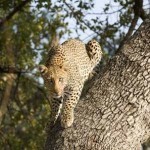 The leopard had taken an Impala up the tree for breakfast and was just starting his descent. The tree was only 15’ from me. 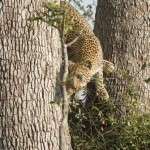 He seemed a little uncertain as to how to come down; he turned backwards and forwards and finally decided on the latter. That was nice, because he was facing us all the way. He moved slowly and spent several moments looking me right in the eye – which makes for great photos! What an unexpected bonus that was! We drove by that tree on our return to Shingwedzi that night. 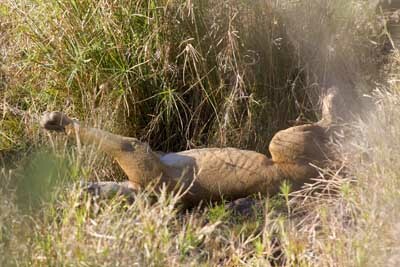 More of the carcass had been eaten, but the Leopard was nowhere in sight. 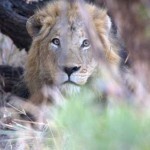 We shared the information and one other couple saw him the next morning in the tall grass – not in the tree. We were the talk of the camp that night! About 20 miles down the road we had another treat. We stopped beside several cars and asked what they were watching. 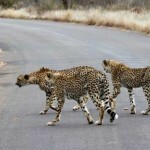 It turned out to be a Mama Cheetah with three teenagers. The brush was heavy, but we saw them moving to a location suitable for resting. While the four of them lay there, an Impala came herd came grazing by. 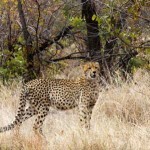 The little Buck realized the Cheetahs were there and came very close, snorting boldly. The young males would rise up on their haunches, lick their lips and turn pleadingly to their mother. She maintained a blasé expression and wouldn’t give permission. This scene repeated itself several times; with the mother maintaining an air of disinterest. Finally, she slowly rose to her feet and led her young’ens back through the brush and across the road; away from the Impala. At last they were in the clear and a lot of shutters were clicking. She posed in the grass to make sure all the tourists got their shot, then led the troops into the brush where they disappeared from sight. We heaved a sigh of satisfaction and continued down the road. That night we were told that we should have stayed. The mother led her teens around to the other side of the Impala herd and watched from the sidelines as the three young males made a successful kill. One lady showed me her pictures and said “I’ll trade with you: my cheetah pictures for your leopard pictures.” So I do have pictures of the event in my possession, but not that I took myself. 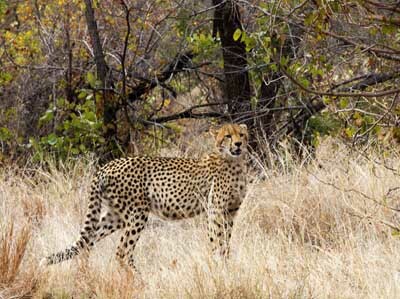 Too late, we were given this advice: “always stay with Cheetahs – they hunt during the day; never stay with lions – they sleep all day!” We’ll bear that in mind for the next trip! Sure 'nuff - sleeps all day! Next Chapter: Time flies when you’re having fun!